Dental veneers are a great choice for many patients who want a fix for several cosmetic dental issues. If you are looking for the right dentist to perform this procedure, you should know that veneer preparation and application are extremely technically challenging. Potentially life-changing, veneers have to be done by the right dentist if you’re going to get the natural, artistic, enduring look you want. You should be aware that not every dentist has the training or experience to place veneers successfully. To help our patients, we have prepared this guide to possible veneer problems and what you can do to avoid them. Any good dentist is going to conduct a thorough exam, which often includes x-rays, before applying veneers. This examination is crucial to check for ongoing disease or infection. Why? Because applying veneers to teeth that are decayed or suffering from gum infections is never a good idea. The presence of veneers can make treating these problems much more difficult. If you do have tooth decay or gum disease, this does not mean you cannot receive veneers. You will just need to have these problems treated first by Dr. Alhadef. Once your mouth is healthy, he will likely be able to offer you veneers. Veneers are supposed to be permanent, right? Yes, in the sense that they are not removable by the patient. While dental veneers should normally endure for decades, you can shorten the lifespan of your veneers with some bad habits. Bruxism or tooth grinding and clenching is one of the worst habits for veneer durability. If you grind your teeth, either consciously or during sleep, you can easily take years off the life of your veneers. Dr. Alhadef never applies veneers without first taking a dental and medical history from his patients and checking for signs of bruxism. He wants you to get the maximum lifespan out of your veneers, and he can help with tooth grinding using measures like a protective nightguard. You can easily find veneer horror stories on the internet. Tales of weeks of pain and severe sensitivity abound. But in almost all of these cases, the dentist was outside the US and offered “lunchtime veneers,” rushing the procedure. As mentioned above, veneer application is not a technically simple procedure. Dentists who offer veneers should be specially trained, experienced, and committed to doing the work properly. Dr. Alhadef certainly meets all of these requirements. He takes the time to perform the procedure correctly. He will use a local anesthetic to numb your mouth during the procedure. Afterward, you may notice a bit of soreness or sensitivity in your teeth for a few days, but this discomfort can almost always be controlled with over-the-counter ibuprofen. In the rare event of more severe or persistent pain, Dr. Alhadef is dedicated to helping his patients in any way possible. If you like a celebrity’s hairstyle, you can bring a photograph to your barber or stylist. Although you won’t look exactly like the celebrity, they can set you up with the same hairstyle. The same does not hold true for teeth. Teeth, mouth shape, and facial structure are unique, so a dentist will not be able to give you the exact smile you saw in a magazine or on the internet. However, Dr. Alhadef will make every effort to provide you with the smile you want. He can show you before and after photos of previous patients’ veneers. Dr. Alhadef also provides his patients with temporary veneers to wear while their permanent veneers are being crafted. This gives you the opportunity to “try out” your new smile and become used to the feeling of veneers. Veneers are as much about artistry as they are about dental science. 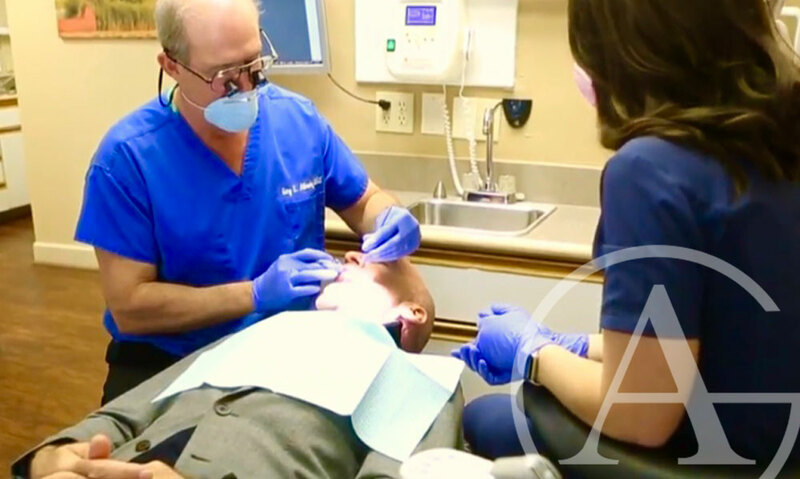 Any qualified dentist can check your mouth for cavities, but it takes a cosmetic dentist with years of experience, like Dr. Alhadef, to offer truly gorgeous veneers. We pride ourselves on having your new smile look natural! To apply veneers, Dr. Alhadef will reshape your teeth a bit. It will also be necessary for him to remove a thin layer of enamel from your teeth to allow the veneers to adhere to the tooth surface. This procedure is called prepping. There have been cases where dentists have not been conservative enough in their prepping, removing too much of the tooth. This practice can lead to tooth sensitivity and other problems down the road. Dr. Alhadef is always careful to remove the smallest amount of tooth mass necessary for the veneers. If a tooth is not suitable for a veneer, he will let you know and discuss your options with you, rather than going ahead with veneer application and risking your dental health or an unsatisfactory cosmetic outcome. Green, H. “Porcelain veneers could ruin your teeth, your smile…and your life.” Daily Mail. 25 August 2008. “Improving Your Smile With Dental Veneers.” Journal of the American Dental Association. August 2003;134(8):1147. Machado, A.M. et al. “Direct or indirect composite veneers in anterior teeth: Which method causes higher tooth mass loss? An in vitro study.” General Dentistry. November-December 2014;62(6):55-57. Radz, G. “Veneers and the 10 most common mistakes.” Dental Economics. 1 February 2007. Tabin, E.M. “6 Things You Need to Know Before You Get Veneers.” Newbeauty. 05 July 2016.